Sennheiser CX 5.00i review | What Hi-Fi? What’s the most important battle in the headphones market? It’s not the one between £1000 pairs only those with second homes and stock portfolios can afford. Instead it’s the fight to be first among the sort of in-ears you might buy when you choose to upgrade from the freebies that came with your phone. In that case, these Sennheiser CX 5.00is stand a chance of winning this particular scrap. These earphones cost £50 and are a significant upgrade over the old Sennheiser CX500s, not least in the style stakes. Until the SoundMagic E10s came along, the Sennheiser CX300s and CX500s were an easy-to-recommend upgrade for those on a tight budget. They were little, rounded buds that looked fairly cheap, but did the crucial job of upgrading your sound. This new line looks more robust. Little silver stems and more substantial earpieces mean these no longer look like cheap in-ears. In fact, Sennheiser has offered earphones that look a little like the CX 5.00i for over £100. Those previous Sennheisers, like so many affordable models, were known for failing around the union between earpiece and cable. But the Sennheiser CX 5.00i’s design is aimed at eliminating that weakness, with a much more substantial frame. They are among the more expensive-looking models at the price, without resorting to the usual trick of using an aluminium shell. 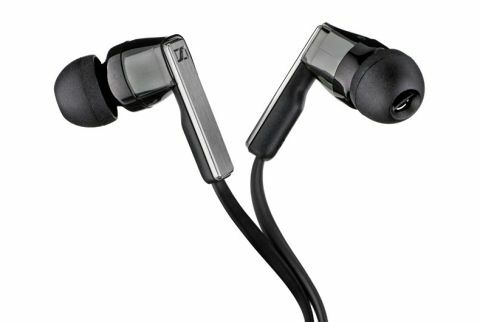 The design is similar to that of the Sennheiser Momentum in-ears, but with more conventional looks and cable management. The only remaining weak point is the cable itself. The Sennheiser CX 5.00is have a semi-flat cable that’s reasonably thick, but seems a little too easy to deform. Three pairs of rubber tips are included and, though some have reported that they become loose after a while, they’ve proved rock-solid during our testing. The cable is non-removable, and has a three-button remote designed for iPhone and iPad, though Sennheiser has a CX 5.00g variant with a remote optimised for Android. Improved design is one thing, but sound quality is still far more important. Not only are the Sennheiser CX 5.00is some of the best-sounding earphones at this price, they can also compete with Sennheiser’s own more expensive Momentum in-ear. The most obvious difference between the two is that the Momentums enjoy deeper, fatter bass. All the other strong points are here. The CX 5.00is sound large for a pair of in-ears, and have a rich, luxurious tone that makes music seem full but not clogged or murky. Despite having slightly less impressive low-bass power than the Momentum in-ears, the Sennheisers' bass is satisfying. It’s well-integrated and smooth, and also better-controlled than that of the SoundMagic E10s. We wouldn’t be surprised if Sennheiser’s engineers had “beat the SoundMagic E10” as part of their brief for these in-ears, as they tick off similar bullet-points: full, detailed sound with solid bass at an affordable price. In direct comparison, though, the Sennheiser CX 5.00is have a wider soundstage and slightly better weight and texture across the mids. The SoundMagics’ upper mids guard a little better against harshness, but the Sennheisers make for a more involving and articulate all-round listen despite a slight synthetic granularity that creeps in with the most wailing of vocalists. If you want a real sound upgrade but don’t have a huge budget, the Sennheiser CX 5.00is are now among the best in-ears you can buy. They look smarter than their price would suggest, and their sound is full, rich and wide. It’s a satisfying combo.